Resolution is the degree of sharpness and clarity of a displayed image. In electronic LED signs, resolution is based on two primary factors, the matrix area and pitch. The matrix area is also known as the pixel matrix, which corresponds to the number of pixels that make up the display area. Electronic LED displays describe the matrix area by the number of pixels vertically by the number of pixels horizontally. For example, 16x80 (16 vertical rows by 80 horizontal rows). The closer the pixels are to each other, the higher the resolution or density of the character or graphic image. Higher detailed images can be shown with higher resolution displays. Simply stated, the more pixels used in an electronic LED sign, the higher the resolution of that display and the image will be. The smaller the pixels, the more that can fit into the display area. A pixel can be one or more LED?s. LED clusters are multiple LED?s installed as a single pixel unit. The distance from the center of one pixel to the center of the next adjacent pixel is called center to center spacing or pixel pitch. The closer the pixels are to each other, the higher the resolution or density of the character or graphic image. The number of LEDs per pixel is determined by the display resolution. 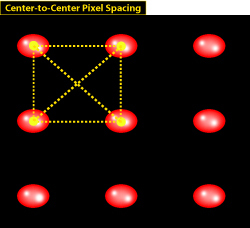 Greater center-to-center spacing increases the number of LEDs per pixel. The reason for this increase in LEDs per pixel is to maintain a superior outdoor NIT rating (brightness). Questions? Our LED sign experts can help. Call us at 800-341-6397.